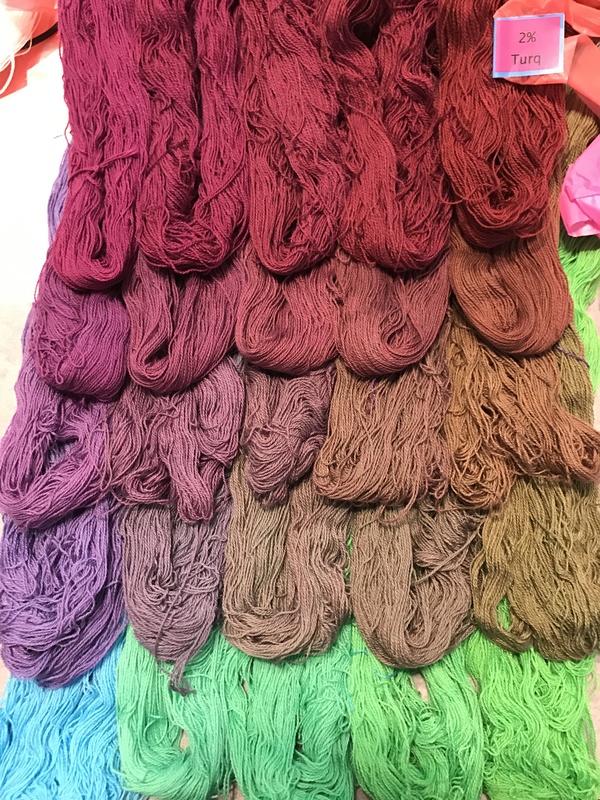 I’m considering changing my dye methodology for my 1500+ samples. 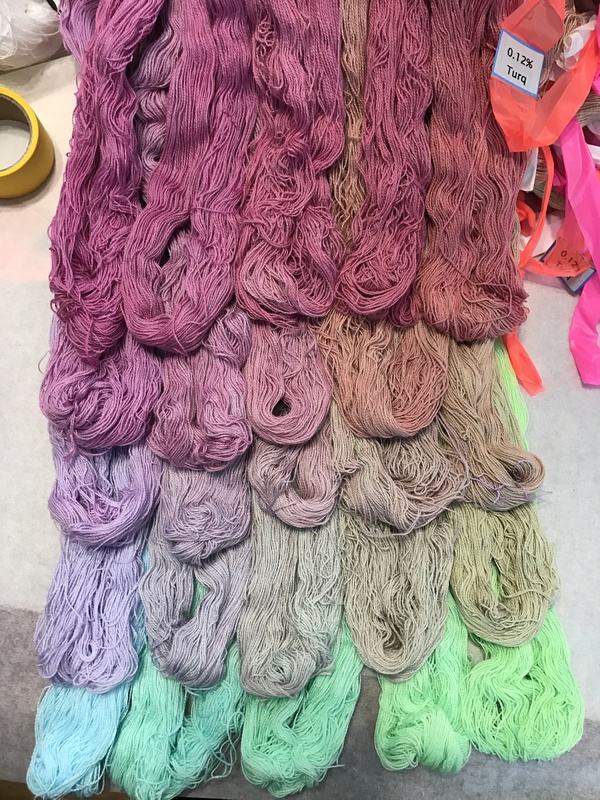 I timed some steps, did some calculations, and discovered that the rearranging and relabeling of skeins between dyebaths takes a lot more time than expected. 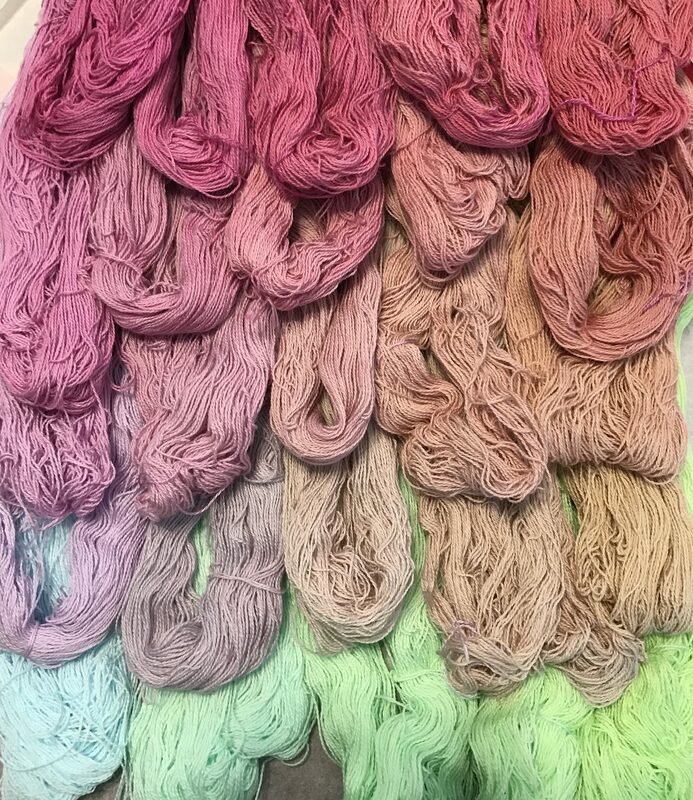 The total amount of time required for each skein comes out to almost 10 minutes a skein! That is, at least in theory, pretty close to the amount of time required for individual dyebaths. 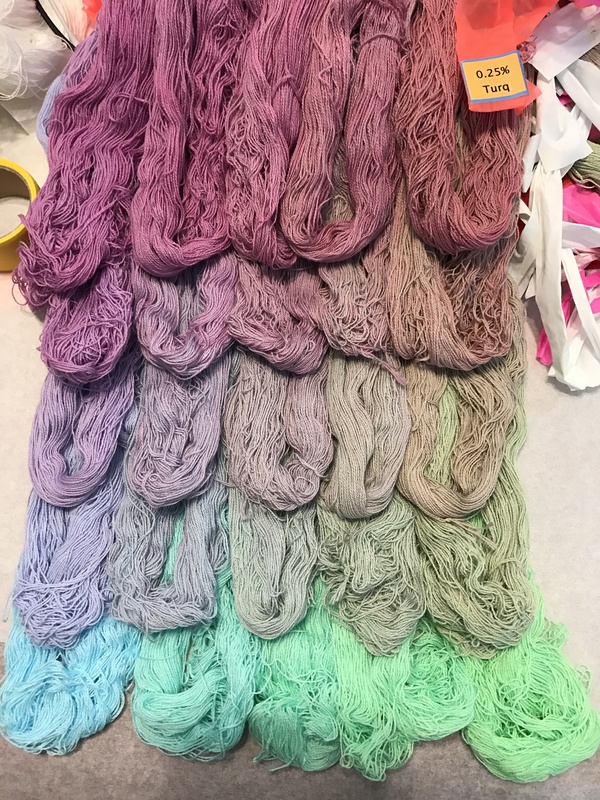 And individual dyebaths would be of more practical use since I wouldn’t have to do three dyebaths to replicate the color in the sample. A bucket below the jars contains a pump and a bucket heater (to maintain the temperature). Water is coming up from the bucket through the left-hand tube. A clear tube on the right side siphons water out of the bath and into the next circulating water bath. Because the pump and siphon are on opposite sides of the container, water moves through the entire container, keeping the temperature even. A temperature probe (the cord taped to the back right corner of the water bath) controls the heater in the bucket and keeps the temperature of the bath at 90F. The second circulating water bath is a bit simpler. It’s located a few inches below the first water bath, so gravity pulls water through the siphon in the first water bath down into the second bath. A second siphon at the opposite end of the container pulls the water down and into the bucket, to be pumped up again. (Here the inlet hose is in top right, and the siphon to the bucket is in the bottom left corner. It’s an elegant solution, but also quite fussy. The siphons have to remove water from each circulating bath at the same rate that the pump is pumping it in, which is a bit tricky. 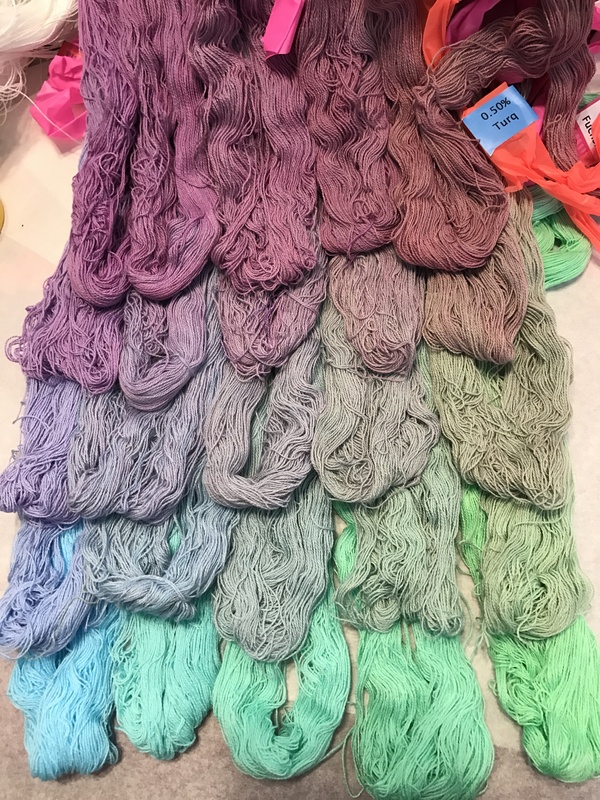 I accidentally flooded my first set of skeins when I made a small adjustment, walked away to check my email for a few minutes, and came back to find the water bath overflowing! Lesson learned: if you’re doing something for the first time, for heaven’s sake don’t walk away from it and assume it will work! I found initially that the jars, when empty, tended to float. So I stuck rocks into them to weigh them down. (No, those are not potatoes in the bottom!) It worked, but I have some better ideas for next time. 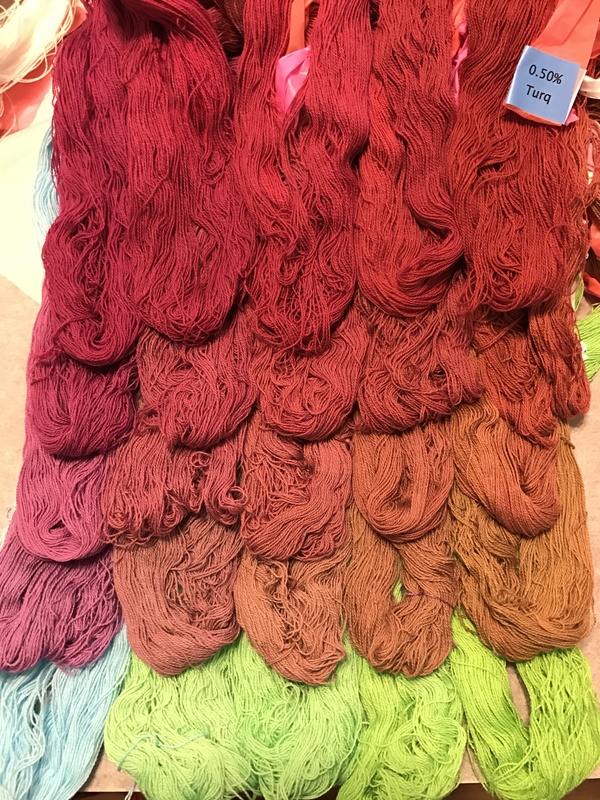 Each dyebath has a different concentration of Gold, Mixing Red, and Navy Blue. 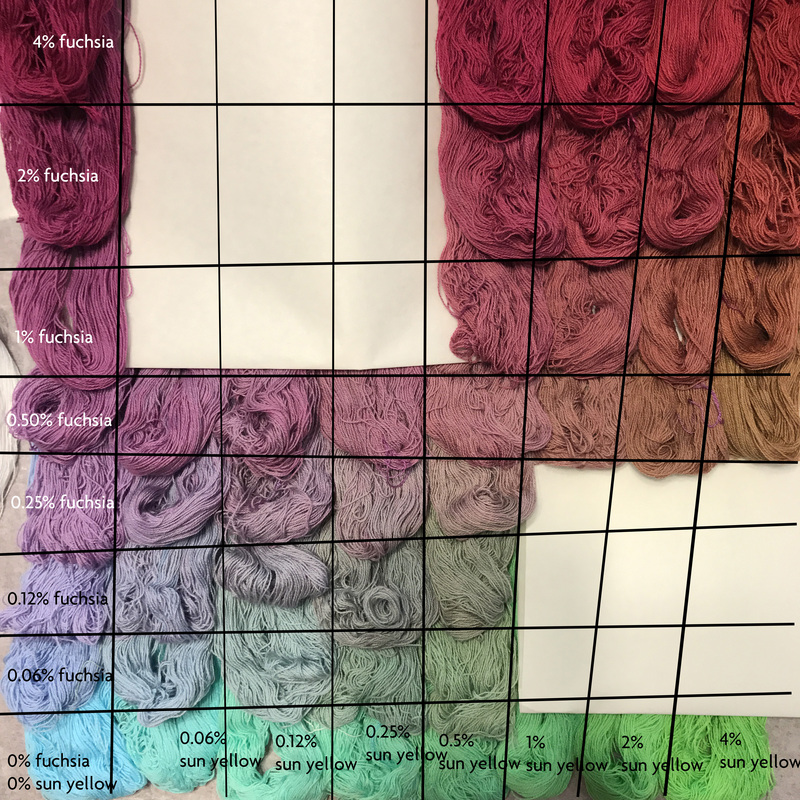 Because of the difficulty of measuring small amounts of dye and other dyebath additives, I made up stock solutions of dye, salt, and soda ash, and measured out the amounts with syringes (tested for accuracy). Here is Kaye (my dyeing buddy) adding soda ash solution to one of the dyebaths. She’s holding the skein up above the dyebath as she adds the soda ash solution with the syringe. As you can see, this method is much fussier and more error-prone than the sequential-dyebath method. However, it will enable me to reproduce the results with a single dyebath. 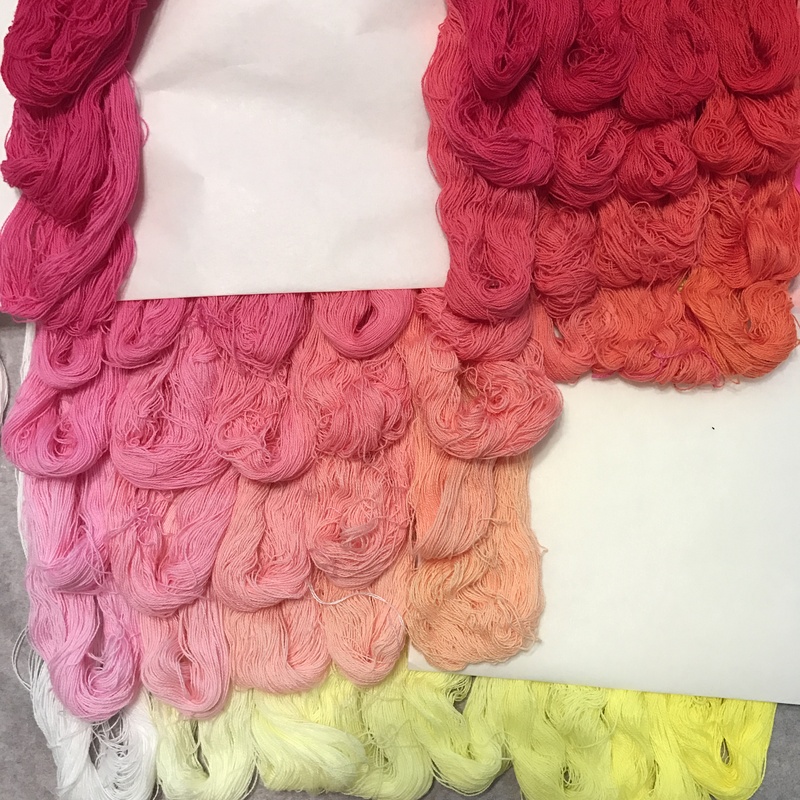 And, if I decide to sell color plates of my samples, they will be much more useful to buyers if they don’t have to do three dyebaths to achieve the same results. So I am continuing to experiment and refine the process, to see if I can make individual dyebaths work. 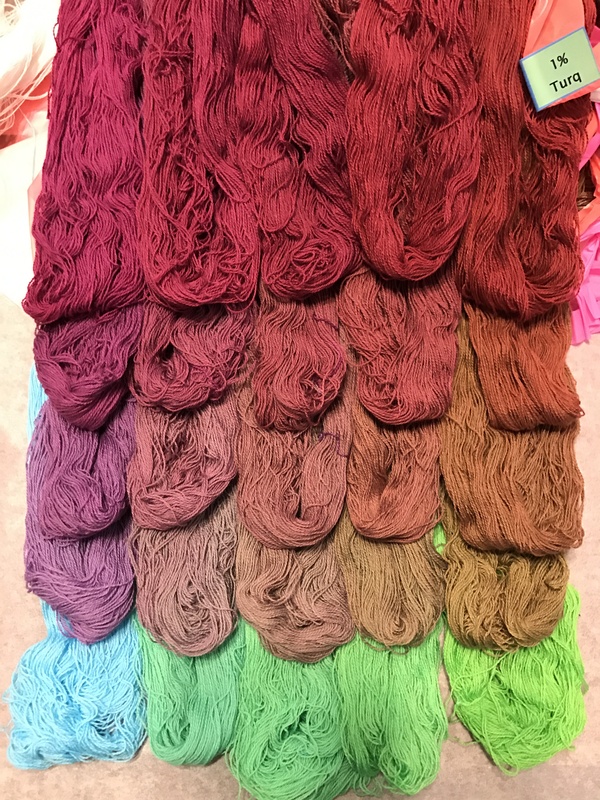 So far I’ve botched three sets of skeins, but I’m learning something with every dyebath, and I’m confident I can figure it out, though it may take me a few more weeks. When you’re doing something new, you’ll inevitably run into snags – this is just giving me more snags than most. 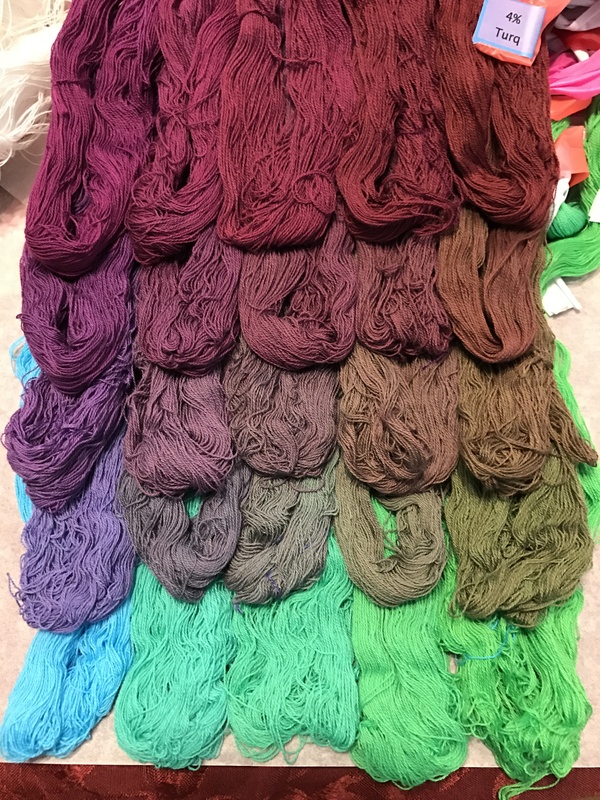 Meanwhile, Mike has very kindly put together a skein-drying and storage rack in the dining room, turning an untidy pile of skeins into a beautiful curtain of color. And that’s it for now! I’m hoping to have pretty pictures of a successful batch soon. Stay tuned! I finished dyeing my first “cube” yesterday. This one covered light to medium shades of the color combination sun yellow/fuchsia/turquoise. It includes every possible combination of these concentrations: 0, 0.06%, 0.12%, 0.25%, and 0.5%, in all three colors. This “level” of the cube is all mixes of yellow/fuchsia/turquoise with 0% turquoise in the mix – i.e. 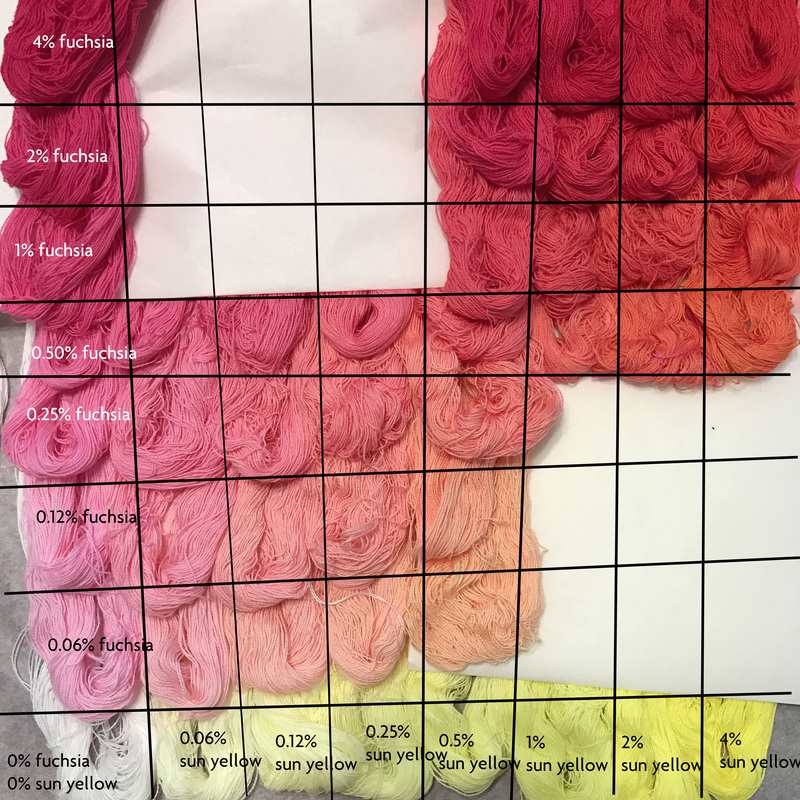 all combinations of sun yellow and fuchsia at the five dye concentrations (0, 0.06%, 0.12%, 0.25%, 0.5%). Each row has a single concentration of fuchsia, starting from 0% at the bottom and going to 0.5%. Each column has a single concentration of yellow, starting from 0% in the leftmost column and going to 0.5% in the right-hand column. Each row/column of this set of samples (except 0.06%, obviously) doubles the amount of dye in the solution. I find this interesting because the visual effect is a linear progression (that is, the colors look about equally far apart from each other), but the dye amount is increasing exponentially. So dyes are very much nonlinear in their effect on fiber. The second thing that interests me is the big color jump between 0 and 0.06% in the fuchsia. 0% is dead white, but even at 0.06%, the fuchsia is a light-to-medium pink. The jump is highly visible across that entire row – the bottom row is shades of pure yellow, and suddenly – bam! – the next row is clearly orange. If I want a smooth color progression I’d have to insert an 0.03% row and maybe even an 0.015% one between the first and second rows. That is an amazingly small amount of dye to have such impact. The third interesting thing is that the fuchsia is a stronger mixing color than the sun yellow. 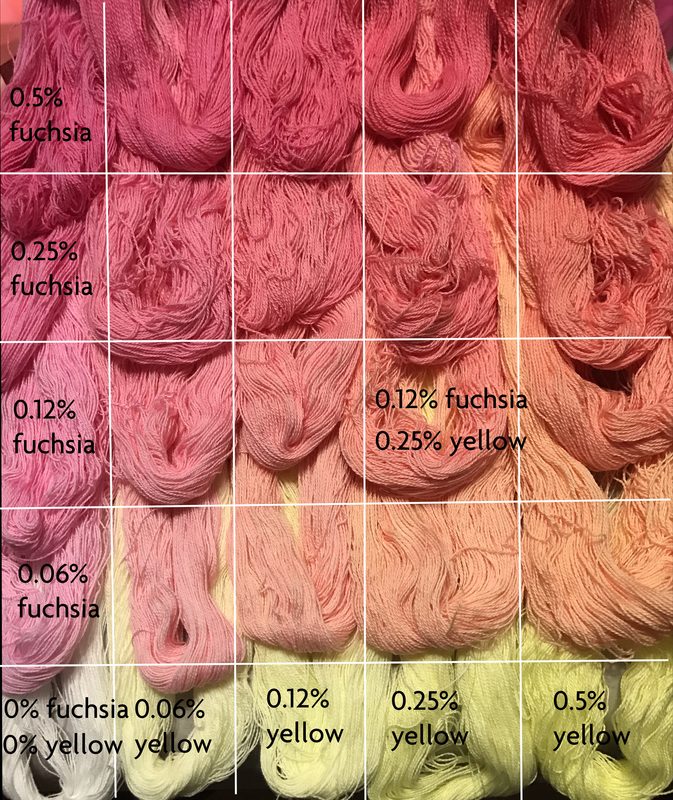 If you look at the diagonal from bottom left to top right, where the amounts of dye are equal, you can see that the result leans strongly towards fuchsia – and this becomes more pronounced as the concentration of fuchsia goes up. In fact, you don’t really get orange unless the amount of sun yellow is 4-8 times greater than the amount of fuchsia. This fits with my experience – it takes very little red to turn a yellow dye bath orange – but it’s interesting to see it play out in a systematic way. The next level of the cube shows what happens when you add 0.06% turquoise to the mix. 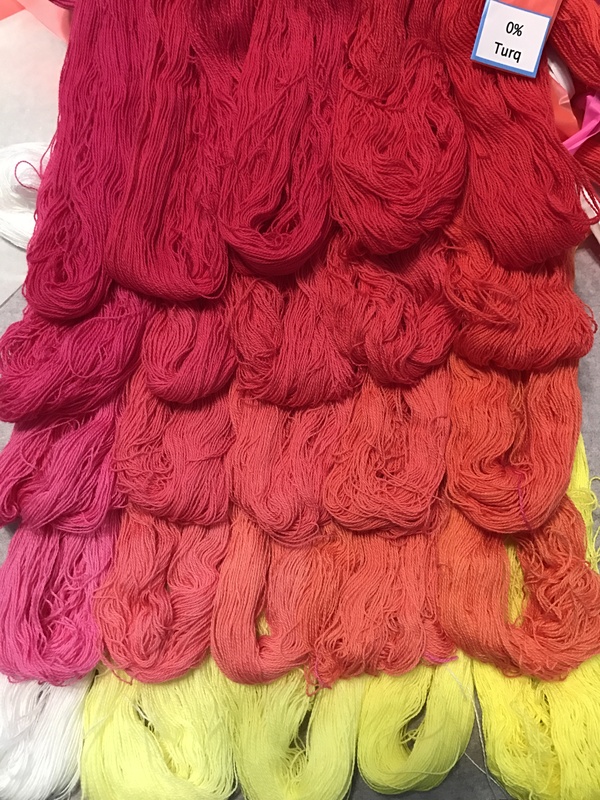 The rows and columns have the same amount of fuchsia and yellow as in the first level, but all the skeins are dyed using 0.06% turquoise. As you can see, there’s a strong and immediate change from yellow to green, though not as strong (I think) as the change from 0 to 0.06% in fuchsia. This suggests that turquoise is stronger in mixes than yellow, but not as strong as fuchsia. Also, neutral colors are starting to appear – there’s a gray (leaning towards purple) in the intersection of the second row and second column. The colors have shifted noticeably towards blue, but the (now slightly cooler) gray remains in the second row/second column, rather than moving towards the top right, as you’d expect. 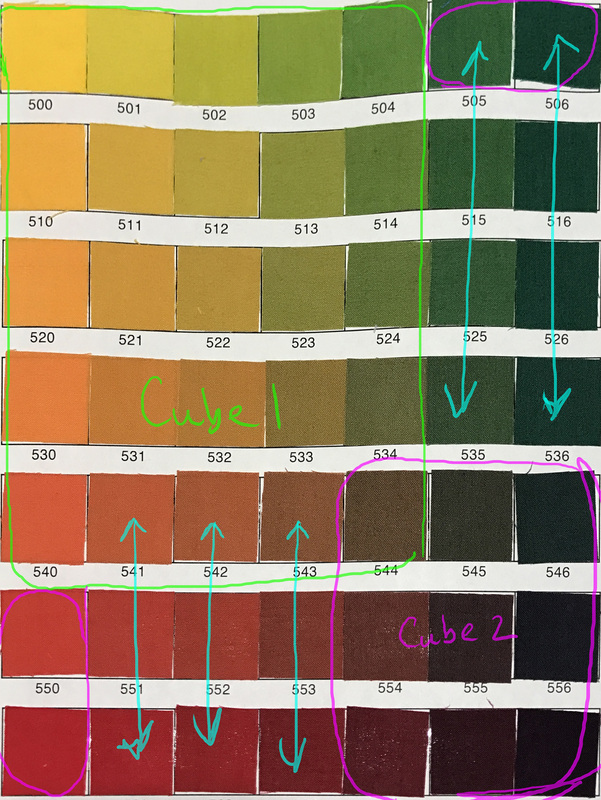 The fact that you don’t find a good gray in the third column shows that the fuchsia is much stronger than either the turquoise or the sun yellow. Astonishingly, the gray is still in the second row/second column. Now the grays are starting to shift to the next level up, though the gray in the third row/third column still looks distinctly pink. Another interesting thing is that, at a casual glance, the adjacent levels of the cube are the same color. But in reality they are progressing towards a colder and bluer version, which is more obvious if you put non-adjacent levels together. To illustrate this, here is Level 2 (0.06% turquoise again. If you look from it to the above photo of Level 5 (0.50% turquoise), you can see the difference distinctly. And that’s it for today! 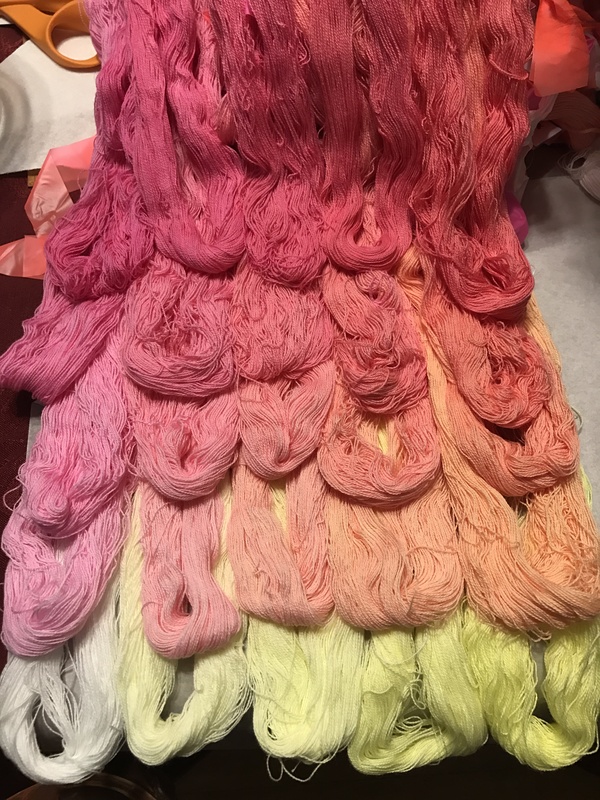 I have the sun yellow/fuchsia/turquoise dark colors dyed and in the rinse bucket now…I’ll post those once I have them done and dry, probably tomorrow. It’s been fascinating looking at these 125 samples, and I’ve already learned a lot. I can’t wait to see the next batch!